Seriously….how can you not like meatballs?? I like to make my own with mince, a bit of rice, onion and a nice bit of seasoning. Add the mince and all of the other ingredients to a big bowl and squidge (is there such a word!?) with your hands until it is well combined. Then shape into wee balls whatever size you and your crew fancy! Brown them a wee bit, if you want but they can be just popped into the sauce. Remove meatballs and make the sauce…..
Saute onions and a clove of garlic. Chuck in a couple of cans of chopped tomatoes and a squeeze of tomato purée. Sprinkle in some oregano. If you need to adjust the sauce with a wee bit of water if it gets too thick. Now plop your meatballs in, turn down and simmer gentle for about 50 mins. p.s. Special secret that is very child friendly and is totally against my no tin anything policy. You could add a can of tomato soup….kids love it! So this morning I found a tiny window between baby sleeps and two school pick ups to embark upon a cookathon! It consisted of tonight’s dinner of Chilli Chicken, Brocolli and Stilton soup and I roasted a wee chicken for my lunch to have with some avocado salad and then turned her into a chicken stock for my freezer!! So easy you could make it while chatting on the phone!! This recipe will give you enough for around six people. Chop the onion quite finely and fry gently in some oil until soft. Add the broccoli then the stock. When the stock is at boiling point, turn down slightly and simmer for roughly five minutes. Really until the broccoli is just soft but retaining its gorgeous green colour. When done, add the Stilton to taste, then whizz with a hand-held blender. You could experiment with other cheeses if you fancy! The Chilli Chicken is a great tasty wee number for mid-week that is also super quick! Soften the onions for five mins then add in the garlic. Gently fry for another three mins. Throw in the chicken and lightly colour it. Add the peppers for a couple of mins. Add all the spices. Play around with these according to your taste. I did not add too much chilli as I was feeding it to my toddler, but I love spicy to I added loads of cayenne to mine once his was out! Add a bit of flour roughly one tablespoon to thicken, you be the judge. Add your chicken stock stirring as it thickens then add the chopped tomatoes. You may need a touch more chicken stock. Bring to the boil, then turn down and simmer gently for 20 mins. Add the kidney beans and cook for a further 10 mins. 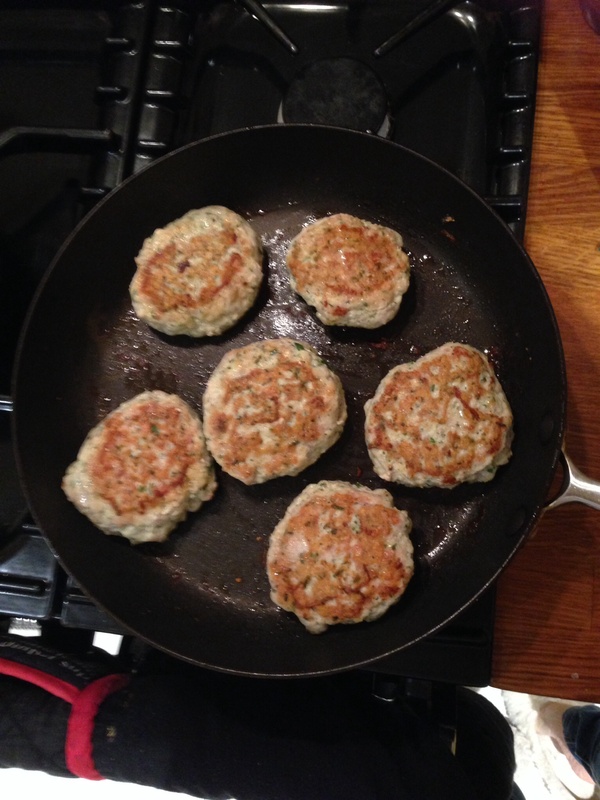 Chicken Burgers……no, not that sort! Tut tut shame on you! We are talking seriously fresh and fabulous. Stick the whole lot in the food processor whizz and then make your burgers. They will be a bit sloppy so wrap them up in foil to firm up. Cook them in a little oil in a frying pan then transfer to an oven at 180 Celsius for around 15 mins. Really gorg served with a green salad with lemon dressing and Cajun sweet potatoes. Tonight I opted for a quick Moussaka. Moussaka is a dish I have made many times in the past. With all the salting of aubergine, boiling and slicing of potatoes and Béchamel sauce making – it becomes quite an arduous task! I simply made the sauce and topped it with crumbled feta and chargrilled aubergine! Serve with a nice green salad and some fresh crusty bread. Time saving and slightly healthier! Yum!! Slice aubergines and salt them to remove bitterness. Leave to sit for an hour then rinse salt off. Brown the mince and periodically drain it to remove some of the fat from the lamb. Remove mince. Add onion and gently fry for 10 mins, add the garlic and fry for a few more mins. Add the meat back in and add the cinnamon, oregano, allspice, tomato purée and the tins of tomatoes. You may need to add water if it looks too dry. Serve on a plate topped with crumbled Feta and the aubergines.